Browse: Home / krackdetector – Detect and prevent KRACK attacks in your network. 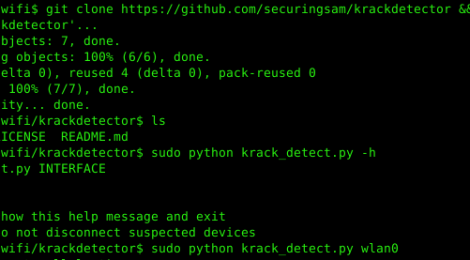 KRACK Detector is a Python script to detect possible KRACK attacks (https://www.krackattacks.com/) against client devices on your network. The script is meant to be run on the Access Point rather than the client devices. It listens on the Wi-Fi interface and waits for duplicate message 3 of the 4-way handshake. It then disconnects the suspected device, preventing it from sending any further sensitive data to the Access Point. ← nullinux – linux SMB null session identification and enumeration tool.